Houston, Texas’ largest city, is home to over 2.2 million people. In fact, it’s the largest city in the South in terms of size and population. The sprawling Texas city is named after Sam Houston, president of the former Republic of Texas. 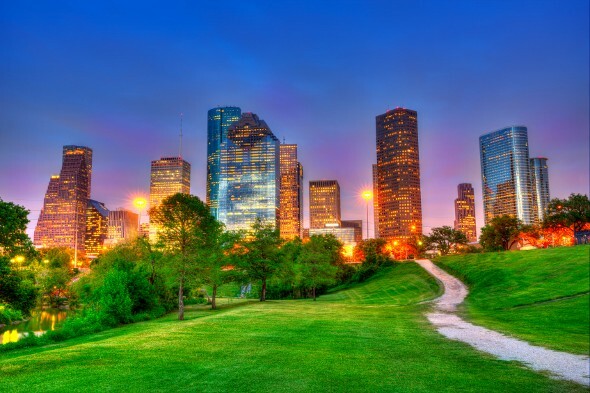 Considering a move to the mega-city of Houston? 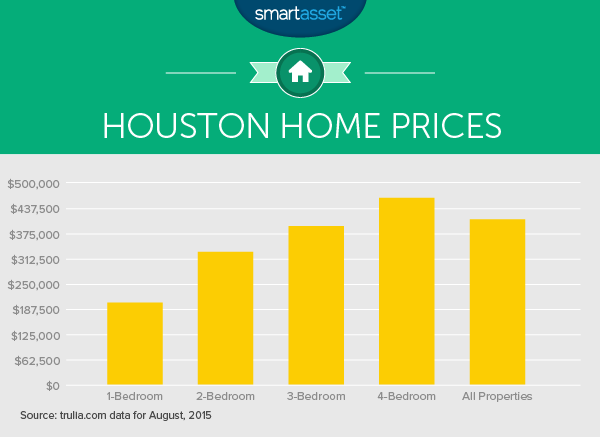 Here’s our rundown of the cost of living in Houston. The US Census Bureau found the average homeownership rate in Houston between 2009 and 2013 to be 45.4%. That’s below the Texas average of 63.3%. According to trulia.com, Houston home prices are on the rise. Check out the chart below to see how home prices in Houston vary based on the number of bedrooms you need. If you’re curious how much a mortgage may run you in Houston, take a look at our Texas mortgage calculator. If you want to turn to a financial expert for advice as you consider how moving to the city will impact your budget and your finances, these are Houston’s top 10 financial advisor firms. Not ready to be tied down by a home mortgage? You’ll be renting. According to myapartmentmap.com, you can expect to pay around the average price of $1,020 per month for a studio apartment and $1,026 for a one-bedroom place. Rents rise to $1,369 for a two-bedroom and $1,804 for a three-bedroom. Once you’ve found a place to live you’ll need to keep up with your utility bills. According to numbeo.com, a basic utilities package for a 915-square foot apartment in Houston will cost you $157.07 per month. That includes electricity, heating, water and garbage, at a price that’s 16 cents below the national average. If you want to add internet to your monthly utility bill you can expect to pay an extra $44.09. That’s about 8% below the national average. A night out at a Houston restaurant won’t break the bank. 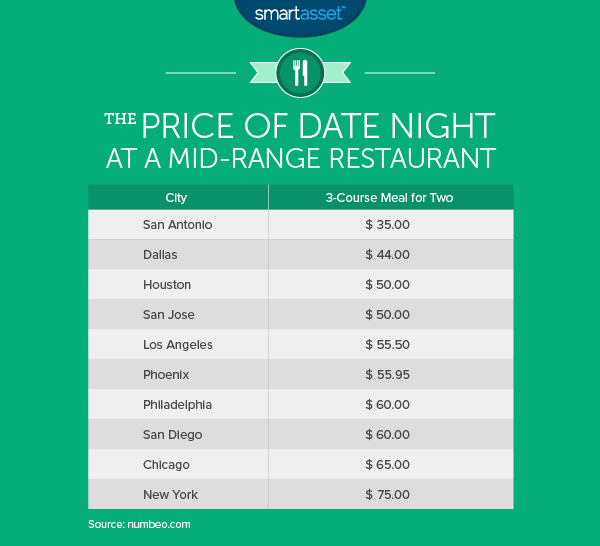 Check out the chart below to see how the cost of date night in Houston stacks up against the cost in similar cities. Prefer to cook your own food? According to MIT’s Living Wage Calculator, an unmarried adult with no children in Harris County has typical annual food expenses of $3,022. MIT’s estimate could be on the low side, though. Numbeo.com’s daily recommended minimum amount of money for food per person for Houston is $10.73, which translates into a monthly minimum of around $332.63 and an annual expense of $3,991.46. A 30-day unlimited pass on Houston’s METRO public transportation system will cost you $90. It’s a driving city, though, with an average commute time that passes the 40-minute mark by some estimates. Adding to the pain of Houston residents’ commutes is the fact that residents of Texas pay the 10th-highest car insurance rates in the country. Harris County, Houston’s home, has car insurance rates that are 11% above the Texas average and has the most expensive car insurance in the state, according to insuranceQuotes.com. Houston is also one of the few US cities where “slugging” is common. What’s that, you ask? It’s informal ride-sharing among strangers. On any given weekday at Houston’s park-and-ride hubs, strangers will line up and accept rides from strangers. The driver gets to use the High-Occupancy Vehicle (HOV) lane and beat traffic. The passengers get a free ride. Everybody wins. Slugging may sound like a recent, sharing-economy innovation but in fact it’s been going on in Houston for over 20 years. Houston residents pay a sales tax of 8.25% when you combine state, county and city rates. That’s pretty steep, but there’s a silver lining. Texas has no state income tax and neither does Harris County, home to Houston. Of course, you’ll still have your federal income taxes withheld from each paycheck, but you won’t owe state or local income taxes come April. The average effective property tax rate for Harris County, Texas is 2.290%, one of the highest in the country. It’s common to have higher property taxes in places that don’t charge an income tax but Houston residents pay a property tax rate that’s double the national average. It incorporates the county tax, the Houston City rate and the Houston School District rate for that total average rate of around 2.3%. Houston has a lot to offer when it comes to cultural attractions. The Houston CityPASS serves as a ticket to five Houston attractions, saving you 47% compared to the combined price of admission to each of the five sites. The CityPASS gets you into the the Space Center Houston, the Downtown Aquarium, the Houston Museum of Natural Science, the Houston Zoo or the Museum of Fine Arts and the Children’s Museum or the Kemah Boardwalk. An adult CityPASS for someone 12 or older costs $51. For children 3-11 you’ll pay $41. Prefer sports games to museums? You’re in luck. Houston has teams in Major League Baseball, Major League Soccer, the National Basketball Association and the National Football League. It’s a sports-lover’s paradise! The average ticket price for a Houston Astros baseball game is $31.82 according to Team Marketing Report. Last year’s average ticket price to see the Houston Dynamos play soccer was $66, according to ticketcity.com. What about the Houston’s NFL team? For the 2015-2016 season, the cheapest ticket for a Houston Texans home football game is $45. That’s an 8.4% increase over last season. Prefer basketball? According to Vivid Seats, the Houston Rockets have a median ticket price of $110. What about the city’s most famous attraction, the Houston Livestock Show and Rodeo?The cheapest RodeoHouston tickets go for $18, but prices go as high as $300 if you want to be in the front row. If you’re thinking about moving to Houston, it can be helpful to know how the change will affect your budget so you can plan accordingly. If you’ll be starting a new job, your paycheck may end up looking quite different than it does now. Try using our Texas paycheck calculator to estimate what your new take-home pay will be.